You heard it here first, folks. One year ago I wrote that a Brevity necklace, made from someone's signature, would be an amazing gift. Now Gwyneth Paltrow's GOOP Gift Guide has listed it as one of their gift picks. I probably should have purchased one a year ago because I am sure they will be sold out until the end of time. October 12, 2014 in As Seen On..., Calling It! A year a go I went globe wild after visiting the Globe Museum in Vienna, Austria. I have given your eyes a year of rest, but now it's time for MORE GLOBES! The next image is from AirBnB's pop-up house project. This house was a design collaboration between Emily Henderson and Moby. Over a year ago Hillary called dalmatian dots. I thought I would take a moment to tip my hat to her. They still rock! June 18, 2014 in Calling It! When I was poking around the internet looking for skull images for last week's post I came across this image. I think it speaks for itself. Texas Chainsaw Massacre: On Trend! June 11, 2014 in As Seen On..., Calling It! I just watched the original Texas Chainsaw Massacre (1974) for the first time and it was RIDICULOUS! That psycho family was so on trend! 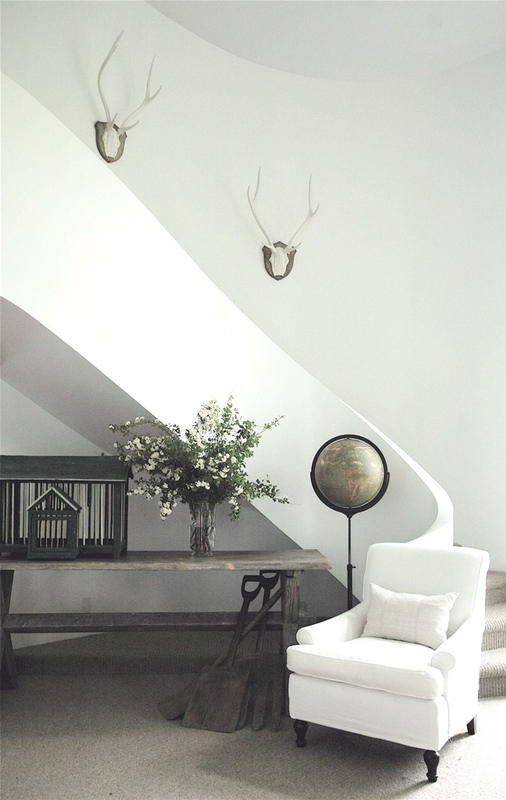 Cool homes have animal skulls mounted on the walls (preferably a cow--rodents and reptiles don't count). April 09, 2014 in Architecture, Calling It! In Los Angeles, indoor/outdoor flow is important. Outside temperatures circle room temperature, and we have few bugs, so people want to leave their doors and windows open. I am a big fan of french doors/garage doors/pocket doors/etc, but now I have my eye on pivot doors. Fabulous! Notice how the floor material inside extends to the outdoors, creating an easy indoor/outdoor flow. This is one of the design elements that will be incorporated in my dream house. March 19, 2014 in Calling It! I was just sent this image by a friend of mine. WHAT THE WHAT! Marie Claire magazine has just release a free magazine and they are calling it Branché. This thin magazine was handed out on the streets of New York City, and doesn't have an online presence. My "id" is saying "That's my name! I thought of that first!" --think the name Branché is cool. --clarified with a real french person to make sure Branché means what I thought it meant (cool, trendy, etc). --feel confident that Americans can handle a word with an accent. In the season 1 finale of Elementary a new set is introduced: Elegant London Art Restorer Flat. Although the easel is functional (and there are many more in other areas of the apartment), it doubles as decorative. I have long desired an H frame easel for none practical purposes. It is an elegant way to display art when you run out of walls. prefer the H frame easel over the tripod style. The H frame has a more intricate design, and can allows the painting to stand upright. A tripod easel tilts the painting back more drastically. FYI: To pull this off, the art needs to be BIG and fabulous. The easel concept reminds me a lot of when I visited Philip Johnson's Glass House. The home is ultra minimal, with no walls dividing the rooms. To delineate the living room from the bedroom, a Poussin painting was place on a steel stand. Yes, he had a multi-million dollar room divider. When I think of a wall covered in a large photograph, my mind immediately goes to Scarface...but is that such a bad thing? Yes, it was meant to be over the top and tacky, but it is still freakin' awesome. There is just something magical about being able to walk over base moldings into a forest, onto a beach, or into a piece of art. The company Wallpapered let's you select or design your wall art, put in the dimensions of your wall, and receive your art in the mail. Or there is Pixers, which does the same thing. I am sure a google will turn up many more options. The picture to the left led me to Steve's Wallpaper and Blinds. The site looks budget to the max, so it makes sense they would have some really affordable wall murals for sale. There are a bunch that are less than $100. Fountains, Geysers, Volcanoes, oh my! July 15, 2013 in Adventures, Calling It! The other day day I visited the Belvedere Palace. In the back garden there was a fountain that was made to look like a geyser shooting out of volcanic rock. This was so lovely. Why don't I see this more? I have pictures without these people in it, but where is the fun in that? I kept walking and stumbled on the Hochstrahlbrunnen Fountain. They were going for a similar effect, but it didn't work. The center part was clearly a ring of stones, and the small outer jets stuck out of their stone clusters too far. So after seeing something I loved, I was immediately shown how it could go wrong. Yes, I am living and working in Vienna, Austria right now. I know you expected my first post about design in Vienna to be about epic moldings, or something like that, but it is actually going to be about globes! After spending a day walking around the city, I wasn't up to doing a big art museum, so I decided to pop into the Globe Museum (I know, super random). But it was fabulous! Rooms and rooms of globes! I didn't know much about globes going in, but now I know....a little bit. I know that globes used to be made in pairs: terrestrial and celestial. I know that moon globes have a blank side because we don't know what the back of the moon looks like. I know that topography globes aren't to scale (they use a height multiplier) because you would barely be able to see Mt. Everest. And I know that I want one. Old celestial globe. The illustrations of the constellations are perfection. Have you been noticing globes popping up everywhere lately? I feel like every well decorated room has a globe in the corner. And I'm not complaining. Globes aren't just popping up on side tables. There has been an obvious trend in globes being turned into lights. Typically they are halved and hung as a pendant, or a light is inserted into one so that it glows. via Apartment Therapy. Follow the link to learn how to make one.